In some specific cases with TV set to standard picture mode, excess colour tendency such as pink picture may be observed after TV power on. Depending on the event information being broadcast, the remote control and the TV front panel buttons may not function. On HD services some picture artifacts may appear. When the update download is complete, check that the file size is 25.729.896 bytes. 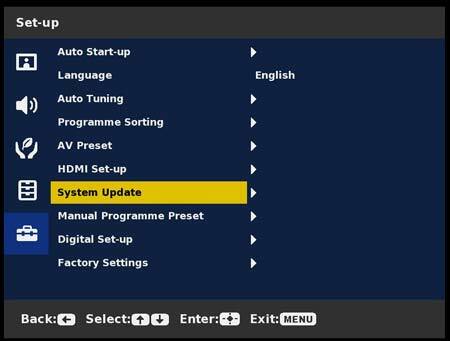 If the version number shown on the first line is M6.039, your TV set has been correctly updated.